Costs to install a dishwasher vary from $140 to $210 for labor or expect to spend $130 - $180 if additional replacement parts have to be purchased for the proper dishwasher installation. Most installers and local plumbers have a fixed rate and standard installation or dishwasher replacement cost will be priced with no prior in-home estimate required. A licensed plumber or certified installer will charge $165 - $230 for installing a standard build-in 24” wide under counter dishwasher. Local handyman can complete the work cheaper. Depending on who will be hired, location, property type and work complexity labor rates might vary as much as 30% for same scope of work to perform. If plumbing and electrical are ready to hook up the dishwasher and there is no need in replacing existing connections it is possible to install dishwasher by self following simple installation instructions. Additional plumbing or electrical work will result not only in labor cost increase but material expenses as well. Spending $25 - $40 on purchasing a dishwasher installation kit, Teflon tape and couple wire nuts won’t affect the total dishwasher installation cost much, but if there is still no power line to connect dishwasher or drains have to be redone additional $55 - $80 might be charged by an installer for buying AFC cable system, electric box and drain connectors. How much an installer will charge per hour to replace a dishwasher? Hourly rates for dishwasher installation vary greatly. Typically a licensed plumber will price the time at $45 - $55 per hour accounting minimum charge which normally no less than $150 even for one hour of work. If dishwasher replacement is a part of a bigger renovation project a contractor will estimate the work cheaper and will add an extra $45 - $60 for simple dishwasher installation. Stores which sell kitchen appliances as well as independent installers might offer discounts and have lower labor rates per appliance to install if all four of them including a refrigerator, stove, under cabinet microwave and dishwasher have to be replaced at a time. How long does it take to install a dishwasher? Typically standard dishwasher replacement will take 1 – 1.5 hours to complete the work from removing existing to installing and testing a new dishwasher. Additional plumbing and electrical work will consume extra time, but even complex replacement shouldn’t last longer than a few hours. Prices vary from $215 for a simple with one washing cycle single drawer plastic dishwasher to over $1,650 for a brand name stainless steel dishwasher with automatic temperature control and steam cleaning. While shopping for a new dishwasher, consider always the quality factor and take into account that cheapest might not be the best solution because of poor performance and reliability. How much does it cost to do plumbing and electrical for a new dishwasher? 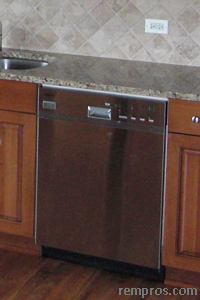 Adding a dishwasher as a new fixture in the kitchen will result in higher expenses for labor and materials. Installing new water supply and power lines as well as connecting the dishwasher will be estimated at $370 - $950 or even more depending on work complexity and materials prices. Is there an additional fee for dishwasher disposal? Typically extra $40 - $65 will be charged by an installer for hauling away an old dishwasher. But if kitchen appliances in working condition, donation or even selling them can be a good alternative for those who are willing to save on disposal. How much did you pay for dishwasher installation?